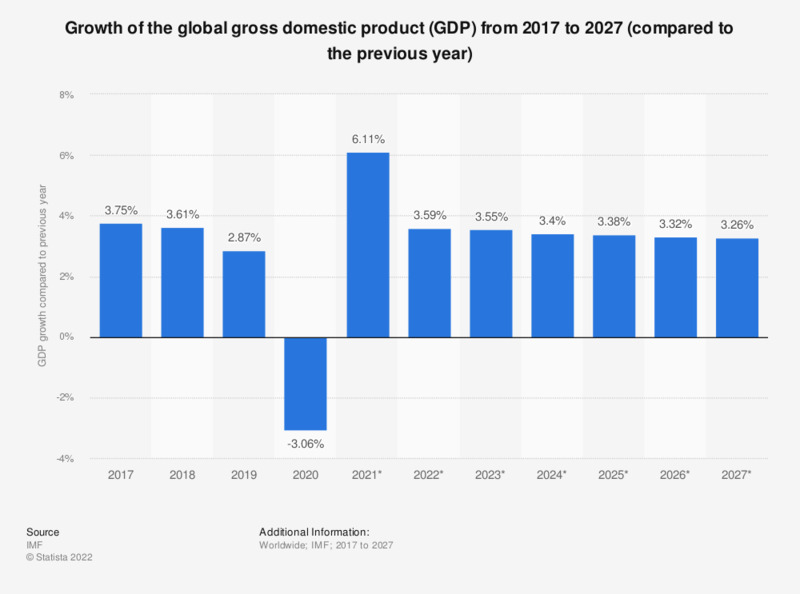 The statistic shows the growth in global gross domestic product (GDP) from 2012 to 2017, with projections up until 2022. In 2017, the global economy grew by about 3.74 percent compared to the previous year. Gross domestic product, also called GDP, is the market value of goods and services produced by a country in a certain time period. It is an important factor to evaluate the economic state of a country: the higher the GDP of a country, the better its economic state. Another important indicator is GDP per capita, which literally means “GDP per person”, but despite its name, it is not used to determine the standard of living in a country, as it does not reflect an individual’s personal income. Instead, it shows the theoretical distribution of a country’s GDP among its inhabitants at a certain point in time. Again, the higher the GDP per capita of a country, the better its economy is set. Global gross domestic product is a key indicator for global economy, which combines all individual economies worldwide. When looking at the gross domestic product / GDP of selected global regions, it is obvious that GDP is highest in industrialized countries. A look at the distribution of GDP of the main industrialized and emerging countries in selected countries shows that the United States’ GDP is the highest by far, followed by China and Japan. The United States, China and Japan are thus the largest economies in the world, followed by Germany. This status is reflected in their GDP per capita; again, the United States lead this ranking, followed by Japan and Germany. When it comes to countries with the highest increase in GDP in comparison to the previous year, however, none of these countries are among the first few. This ranking is led by Libya, had quite a significant economic lead over the others. The figures were rounded for a better comprehension of the statistic. * forecast. Everything On "Global economy" in One Document: Edited and Divided into Handy Chapters. Including Detailed References. Millennials: In your opinion, which country or countries will be the biggest driver(s) of growth for the global economy in the next 10 years?